Dr. Florence, Dr. Kroeker, Dr. Korsunsky, Dr. Schrader and Dr. Sims have pursued further training and certification to deliver intravenous therapy. IV therapy, as administered at the Centre for Natural Medicine, utilizes vitamins, minerals, antioxidants, amino acids, and other natural medications. These nutrients are administered directly into a vein (typically located anywhere from the elbow to the back of the hand). Intravenous administration bypasses the digestive system and consequently allows for higher concentrations to be achieved. This is particularly beneficial to individuals that require high therapeutic doses of nutrients (ie. Cancer patients, fibromyalgia, viruses, illnesses associated with excessive oxidative damage and those with mal absorption issues). Indications for IV therapy include both acute and chronic illnesses. Acute illnesses, such as viral infections, can be treated with IV therapy. High doses of vitamin C and other nutrients are used to treat a variety of conditions (listed below). IV treatments are used to decrease the intensity and duration of the illness. This treatment is primarily used for cancer treatment and infections. It may also be used for severe allergies/hives. Vitamin C, when administered in high doses intravenously, can produce high levels of hydrogen peroxide, a known toxin to cancer cells and various microbes. Normal cells have the ability to reduce the effects of hydrogen peroxide. Cancer cells and micro-organisms, such as viruses, are susceptible to damage by the oxidative mechanism of the hydrogen peroxide. Glutathione is readily absorbed via IV as opposed to the oral route. IV glutathione can be a very useful agent in the treatment of Parkinson's disease, detoxification, kidney disease and various conditions affecting the central nervous system. IV glutathione can also help to prevent and treat the toxic side effects of some chemotherapy. The base formula of the Myers cocktail was formulated by Dr. John Myers, MD. Dr. Myers pioneered the use of IV vitamins and minerals for a variety of medical conditions for more than 25 years. Clinical results have been observed with the following conditions: asthma, migraines and other headaches, fatigue, fibromyalgia, cardiovascular disease, restless leg syndrome, depression and expedited recovery from athletic endeavors. 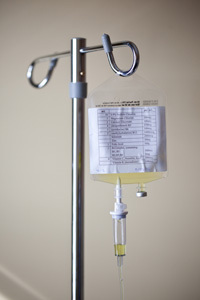 Various professional sports teams and players have utilized IV therapy, including Myers Cocktails and IV vitamin C to stay in optimal form.